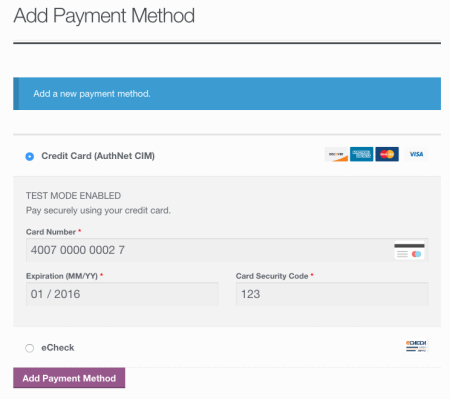 WooCommerce Authorize.CIM 2.0 is here (finally)! We’re super excited to announce that we’ve released a large update to our WooCommerce Authorize.net CIM payment gateway 🙂 While development took far longer than we would’ve liked (initial estimate was 50 hours, the final tally was over 200 hours), we’re really pleased with the final product and we can’t wait for you to update and try it out! This update has undergone many hours of testing and is fully-compatible with WoCommerce 2.4. If you have a current WooCommerce.com license, you can download the update now. Payment gateway integrations are something of a specialty for us, so we usually we’re quite good at estimating development time. Our challenge with this gateway was that the Authorize.net CIM API says it does certain things, but it does not actually do those things in practice. As a result, we built a ton of code around handling edge cases to fix some issues we’ve seen since the initial version was built over two years ago, as well new issues that we uncovered during development. For example, when customers complete the checkout page and click “Place Order” when trying to save a card or using a saved card, they may have entered their CVV code incorrectly. No big deal, they just go fix it in the checkout form and click “place order” again, right? You would think you can do that. Nope. Authorize.net considers this is a duplicate transaction, despite the change in the customer’s CVV, and rejects the updated transaction as well. We’ve tweaked our duplicate transaction checking so customers will never see an error here. What about if your customer moves and has a new billing and / or shipping address? When the customer updates the address in WooCommerce during check out with a saved card, our previous gateway integration did not update the customer’s profile. This meant that transaction information in the control might be wrong, or if you have AVS handling enabled the transaction might have been rejected. Now, both the billing address and shipping address are correctly updated (as needed) for each transaction. We’ve handled these issues and many more in the new version so your store will run smoother. We’ve also laid the groundwork for easier and faster improvements to the Authorize.net CIM gateway in the future, some of which are available today. 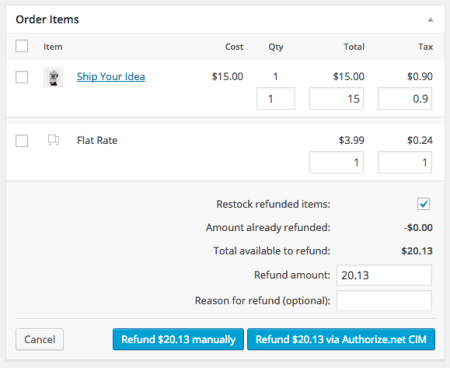 WooCommerce Authorize.net CIM now supports refunding captured orders or voiding authorized transactions from directly within the WooCommerce admin. You can now click “Refund via Authorize.net CIM” to process a refund without ever needing to log into your Authorize.net account. 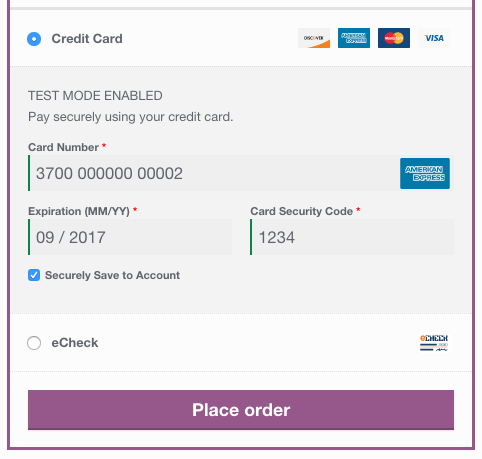 We’ve made the payment form easier to modify or extend for developers, but we’ve also updated the credit card/eCheck icons and improved the credit card/eCheck input forms. Payment forms now show the customer which card type is being used after the card is entered, and provide the option to save the card to the account rather than doing so automatically. A lot of improvements have been made around saved payment methods to make them easier for customers to manage from the “My Account” section. Bank and credit card payment methods are displayed separately in a responsive “My Payment Methods” table. 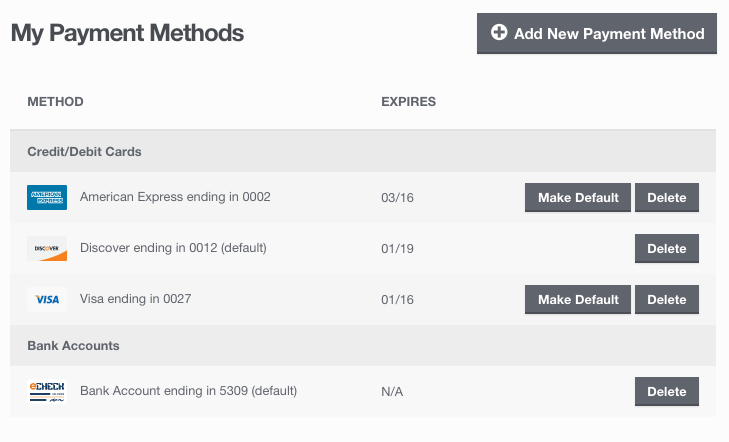 Each type of payment can have a default method selected. We’ve added an “Add New Payment Method” workflow to make it simple for customers to add a payment without going through the checkout process. When clicking “Add New Payment Method”, customers will be guided through the add payment method form. We’ve also added some minor tweaks in this release. First, we’ve gotten questions from merchants who have been contacted by Authorize.net about using the new Akamai URLs for transactions, which we support in both Authorize.net CIM and AIM. You can now enable detailed customer decline messages, which try to show intelligent errors to customers when a transaction is rejected instead of simply displaying “An Error Occurred”. This is most helpful if you have CVV/AVS handling enabled, as your customers will now see a specific error message if their transaction is rejected due to incorrect information. Finally, this plugin (along with all of our extensions) requires WooCommerce 2.2 or newer, and is WooCommerce 2.4-compatible. 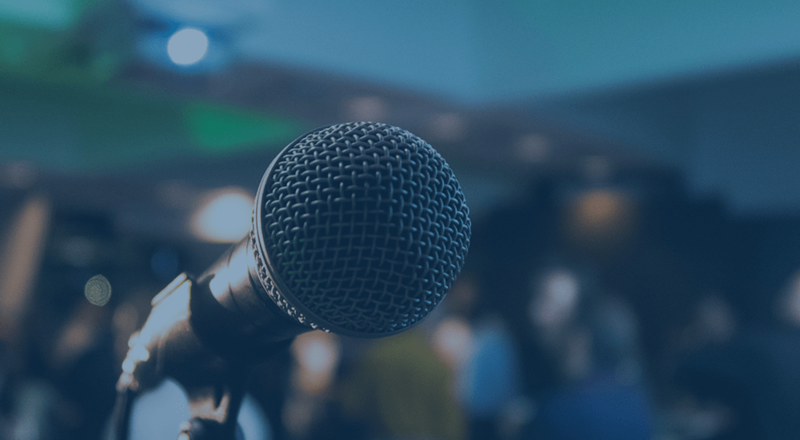 WooCommerce Authorize.net CIM is now our most advanced payment gateway integration, and its handling of customer errors is much more forgiving. We’ll be rolling out some of the features we’ve built for this, such as the “Add Payment Method” capability, to some other payment gateways very shortly. If you’d like to update your Authorize.net CIM plugin, you can do so by downloading the new version from your WooCommerce account or by using the WooCommerce helper. There’s an upgrade routine that happens automatically that will ensure that any saved payment methods, subscriptions, or customer profiles will continue to work with no additional effort. I need to be able to authorize and capture separately because, i have rental products and need to first authorize specific amount and capture only rent amount, Is it possible to do like first authorize some part of whole amount and after authorize need to capture some part of amount. Hey Lalit, you can indeed capture a different amount so long as it’s lower than the amount authorized. Processors don’t allow eCommerce stores to capture a higher amount than the authorization. Hi I have duplicate fields showing for the credit card number, expiration date and the CVV. Hey Dan, please submit a help request and we’d be happy to troubleshoot this for you! Is there a road-map for “Expiring credit card notification” planned? Hi Ron, we currently have this on our idea board for some of our gateways as part of our plugin framework. If you have (or want to create a free) GitHub account, you can follow the issue for it here. I am looking for a plugin that will use the Validate only method. For example, a user makes a purchase in my online store. Their card will be validated with a 0.01 charge and then refunded. I can then process the payment with my Authorize.net account when the item is shipped. Does your plugin support this function?